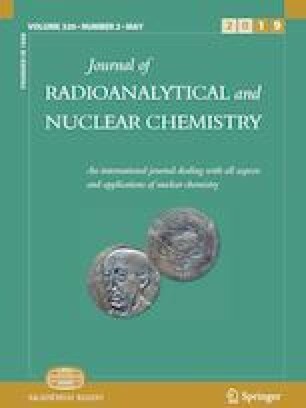 As part of an experimental validation of a nuclear forensics methodology for Pu source reactor-type discrimination, destructive analysis has been performed on two irradiated UO2 pellets with different irradiation histories. Analysis has focused on measuring key Sm fission product isotope ratios used in a previously published maximum likelihood methodology to determine the most likely irradiation history of the pellets. A total of 21 Sm isotope ratios were measured within the irradiated pellets, and generally agreed within 20% of the irradiations as simulated using the Monte Carlo Radiation Transport and material depletion code, MCNP6. Results indicate the chosen approach can accurately measure the isotope ratios within 5% experimental error. The authors would like to thank Dr. Brent Miller (Geology & Geophysics, Texas A&M) for his time and effort in setting up the Thermo Fisher Scientific iCAP RQ mass spectrometer for use with significant activities of long-lived radionuclides. Sample preparation, chemical separation, and mass spectrometry was supported by the Department of Energy National Nuclear Security Administration under Award Number DE-NA0003180. This work was prepared as an account of work sponsored by an agency of the United States Government. Neither the United States Government nor any agency thereof, nor any of their employees, makes any warranty, express or implied, or assumes any legal liability or responsibility for the accuracy, completeness, or usefulness of any information, apparatus, product, or process disclosed, or represents that its use would not infringe privately owned rights. Reference herein to any specific commercial product, process, or service by trade name, trademark, manufacturer, or otherwise does not necessarily constitute or imply its endorsement, recommendation, or favoring by the United States Government or any agency thereof. The views and opinions of authors expressed herein do not necessarily state or reflect those of the United States Government or any agency thereof. All pellet irradiations and simulations were supported by the U.S. Department of Homeland Security, Domestic Nuclear Detection Office under Grant Award Numbers: NSF Grant Nos. ECCS-1140018, DHS-2012-DN-077-ARI1057-02&03 and DHS-2015-DN-077-ARI1099. The views and conclusions contained in this document are those of the authors and should not be interpreted as necessarily representing the official policies, either expressed or implied, of the U.S. Department of Homeland Security.